Millwall's second win in 16 Championship matches inflicted a third straight league defeat on Brighton to increase the pressure on boss Sami Hyypia. Lions striker Lee Gregory latched onto Magaye Gueye's scuffed shot to score the winner with a low angled drive. Solomon March prodded the hosts' best chance of the match wide. 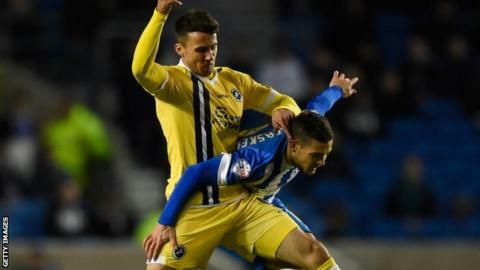 Brighton remain in the relegation zone, while Millwall moved five points and five places above them. The Seagulls have now just won one in their last 17 Championship matches with a section of fans growing increasingly frustrated with Hyypia. The former Liverpool defender took charge in the summer but, after successive seasons of making the play-offs, Brighton's second-tier status is looking precarious. You could sense the anxiety among the home fans and the mood was not helped when the visitors deservedly went ahead on 15 minutes. There was a big slice of fortune in the goal as Gregory was in the right place to collect Gueye's weak shot, before finishing calmly from inside the penalty area. The visitors had lost their previous league match 5-1 at home to Middlesbrough but showed their character with a battling display. Brighton stepped up the pressure after the break without ever really breaking down Millwall's resolute defence. "I feel very frustrated. Usually I'm not a quitter, I'm a fighter. "I can understand the fans' reaction, I don't expect to be patted on the shoulder and told 'well done' with how things are going. I think that's normal, some of the fans are getting impatient and shout things, it doesn't help anyone but you can't control it. "When you take this kind of job, you're always prepared for everything. I'm not afraid of anything happening. Sometimes it doesn't go your way, but in my mind I'm ready for it." "It was a magnificent performance, what a comeback from us after Saturday. "I thought we played really well and deserved the points. Once we got in front we proved we can defend. Now it's onwards and upwards, let's see if we can get two in a row. "My team have done me proud since I've been here, let's keep building and try to get up the other end of the table." Match ends, Brighton and Hove Albion 0, Millwall 1. Second Half ends, Brighton and Hove Albion 0, Millwall 1. Gary Gardner (Brighton and Hove Albion) wins a free kick in the defensive half. Attempt missed. Lewis Dunk (Brighton and Hove Albion) right footed shot from the centre of the box is close, but misses to the left. Assisted by João Teixeira. Paddy McCourt (Brighton and Hove Albion) wins a free kick in the defensive half. Offside, Millwall. Ricardo Fuller tries a through ball, but Scott McDonald is caught offside. Corner, Brighton and Hove Albion. Conceded by Martyn Woolford. Greg Halford (Brighton and Hove Albion) wins a free kick in the attacking half. Attempt missed. Darren Bent (Brighton and Hove Albion) left footed shot from the centre of the box is high and wide to the right. Assisted by João Teixeira with a cross. Substitution, Millwall. Alan Dunne replaces Ángel. Adrián Colunga (Brighton and Hove Albion) wins a free kick in the attacking half. Foul by Andy Wilkinson (Millwall). Foul by João Teixeira (Brighton and Hove Albion). Danny Shittu (Millwall) wins a free kick in the defensive half. Ricardo Fuller (Millwall) wins a free kick on the right wing. Substitution, Millwall. Ricardo Fuller replaces Lee Gregory. Adam Chicksen (Brighton and Hove Albion) wins a free kick on the left wing. Corner, Brighton and Hove Albion. Conceded by Mark Beevers. Substitution, Millwall. Nadjim Abdou replaces Magaye Gueye. Attempt missed. Ángel (Millwall) right footed shot from outside the box is high and wide to the left. Attempt blocked. Scott McDonald (Millwall) right footed shot from very close range is blocked. Assisted by Mark Beevers with a headed pass. Corner, Millwall. Conceded by Greg Halford. Attempt blocked. Gary Gardner (Brighton and Hove Albion) right footed shot from outside the box is blocked. Substitution, Brighton and Hove Albion. Paddy McCourt replaces Elliott Bennett. Attempt saved. Ángel (Millwall) right footed shot from outside the box is saved in the bottom right corner. Delay in match Gary Gardner (Brighton and Hove Albion) because of an injury.